As we prepare to host Hythe Town for what is our final match of the 2017/18 campaign, and our last ‘home’ game to be played at Goring’s Mead, manager Dom di Paola provides us with his comprehensive review of the season. “I want to give you an alternative season review from a management point of view, highlighting some high and low points, just to show you a little of what has happened over the course of the season – it’s been a long and difficult one! Pre-season. We lost Jordan Clark, Kieron Pamment, Evan Archibald and Kevin Keehan from our title winning squad – two of our best midfielders and two of our top goal-scorers. This meant we had a lot of work to do in recruitment. We spent a lot of the summer tying down the rest of last season’s squad and battling to bring in some quality to complement the team, and with some experience of the Ryman League. We had a lot of setbacks and rejections and we struggled to attract a lot of the players we had targeted. It is telling that only George Branford, Scott Harris and Tom Lawley are still here of the signings we made prior to the season starting! In just our second friendly at Newhaven we lost Mark Knee for the season, a massive blow both in the changing room and out on the pitch where his experience and quality would have been a massive help. I then have to hold my hands up and take the blame for a shambolic last week before the season started where we played Eastbourne Borough, Worthing and Bognor in the space of five days. We got beaten heavily with makeshift sides and that massively affected our confidence going into the season. We wanted some challenging friendlies but I got it wrong in terms of when and where we played them! August. We went into the season under cooked, with three debutants in the starting eleven who hadn’t even played a pre-season game for us in our first game at home to Carshalton, and we were comfortably dispatched. Of the sixteen in that opening day squad, only six remain and that tells you just how much we have had to overhaul the squad in order to be competitive! We lost down at Greenwich to the pre-season title favourites before a dark day at Sevenoaks in the FA Cup when we were badly beaten in a performance that was nothing like what we would expect from our side. After this game we lost our captain and one of our inspirational players in Joe Shelley, who took an offer he couldn’t refuse back in the County league. We did some soul searching and the introduction of Liam MacDevitt gave a boost to the squad with his enthusiasm and attitude. He played a big part in a draw at Hythe, after major travel problems, and then a fantastic performance against Lewes at home in a great day for the club and a fitting tribute for Peter Kersley who had sadly lost his wife. Of the sixteen in that opening day squad, only six remain and that tells you just how much we have had to overhaul the squad in order to be competitive! September. With Tony Nwachukwu and Scott Kirkwood joining the club this month, and Josh Pelling having got himself back to full fitness, we began to assemble more of the squad we have gone with all season. A very busy September saw us face eight games in the month, starting with a narrow defeat away against Tooting where former player Billy Dunn did us with his two goals and Matt Whitehead getting sent off in the second half killing our chance of a comeback. Who would have thought at that stage where Tooting would have finished up?! We had a hugely disappointing home defeat against a poor Molesey side before a last ditch win against Chipstead with a comeback from 2-1 down with two goals coming in the last couple of minutes for an exciting finish. We bowed out of the Ryman Cup v Burgess Hill in a decent performance before our early season habit of conceding when going ahead killed us down at Sittingbourne on a horrible day. We were beginning to look more of a team at this stage and a good away win at Three Bridges in a feisty game was followed up with a ‘game of two halves’ draw against an excellent Walton Casuals side at home. We ended the month throwing away three points against Cray at home with a suicidal last fifteen minutes that saw us go from 2-1 up to 3-2 down with some calamitous defending, which was a common theme in those opening months. November. With Dodd’s absence it seemed to galvanise the team and a great last minute win against Faversham at home started the month off in good form. We then beat Newhaven in the Senior Cup with a quickfire opening fifteen minutes killing off the tie. 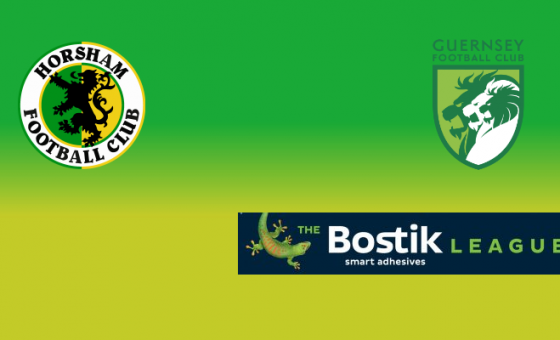 A strong performance at home saw us comfortably beat struggling Chatham as we went into the game against table toppers Dorking full of belief – big mistake! A night to forget saw us get crushed in a terrible display and our biggest ever defeat as a management team. The dent to confidence, allied with a massive injury crisis, saw us face some of the better sides threadbare and we had a tough run of results, with loans, last minute signings and patched up players losing away against Corinthian Casuals, drawing at Cray (with our youngest team out of the season) and a last ditch draw at home against a free scoring Hastings with Darren Boswell, who had missed a number of games and who had a disappointing spell at Hastings, scoring our late equaliser to spark big celebrations. This month saw us lose Liam MacDevitt, who had been a key player for us, to the money bags of Greenwich and it also saw the departure of Matt Whitehead and club legend Lee Carney as the team continued to evolve from the side that started the season. December started in a similar vein, with lack of numbers and injuries meaning we were struggling and looking over our shoulder at the table after we had pulled well clear. We went to Walton Casuals with a scratch squad again and barely registered a shot on goal in a very disappointing day and, after getting robbed at home by Ramsgate when a terrible refereeing decision gave the away side a penalty for a non-existent offence costing us points, we felt the world was against us. We travelled down to Herne Bay the weekend before Christmas and, with it touch and go with fog and our most makeshift side so far with centre back Charlie Farmer playing up front, we battled and scrapped for a 1-0 win in an awful game that stopped the rot but also secured the first win in Kent for the club in six years! Bognor dispatched us from the Sussex Senior Cup before our Boxing Day game saw us beat Godalming 8-1 in an incredible game. 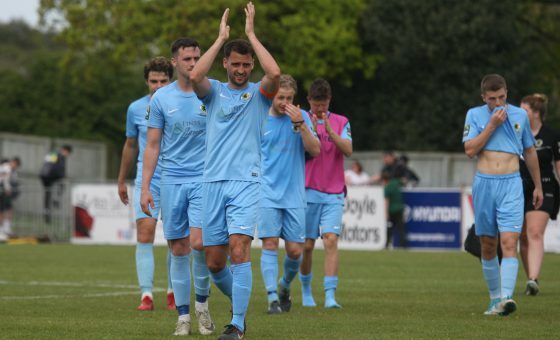 For the second occasion in our time at the club, Horsham made the national press with on-loan George Gaskin’s double hat-trick in the two games he played that day. We then travelled down to Molesey on New Year’s Eve and, in an entertaining game, we drew 3-3 although this will be another game we look back on as dropped points. January. 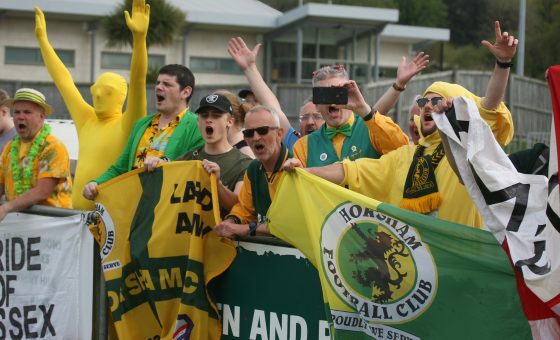 The first match of 2017 will live long in the memory as we beat Lewes away with magnificent support from the Horsham faithful and our boys giving everything to secure the local bragging rights and a Ryman South “double” against our biggest rivals this season. 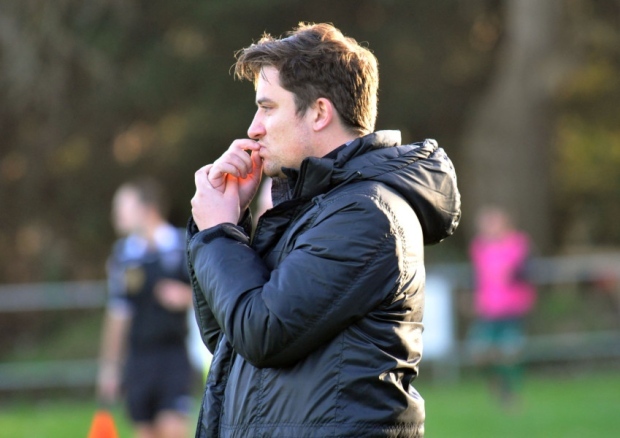 A bore draw versus a poor Guernsey side then saw a standout win against title-chasing Dorking go some way to erasing the memory of that thrashing in the November fixture. We secured another Sussex double by beating Three Bridges on the coldest night of the year, with our loanee Gaskin scoring twice, and finished the month eight unbeaten with a draw in a tough game against East Grinstead. This month saw us close to full strength and with options to pick from, which really highlighted the need for depth within the squad, something we have not been afforded at times this season! February started with a bang, as we were battered 5-1 down at Carshalton. On the day we got our tactics totally wrong but take nothing away from Carshalton, they were the best team we faced all season. The month saw us fall into terrible form. As with the Dorking defeat, we found it tough to get it out of our heads and despite playing some lovely football we lost 3-0 down at Hastings (with another threadbare squad), before not really turning up at home versus South Park and away at Whyteleafe in games where we looked like we had signed off for the season. We set up to frustrate on a long night down at Faversham, just to arrest the slide, and a hard working performance saw us come back to Sussex with a well-earned point. As has been the case this season when we fancy it we can turn it on and, out of nowhere and off the back of our worst run of the season, we beat in-form Corinthian-Casuals at home, with a second half performance that was as good as anything we produced this season. March saw an experimental team and formation beat struggling Chatham comfortably away before the same experimental formation lost comfortably at home versus Herne Bay! We went down to Ramsgate, again missing a number of key players, and managed to secure a battling point showing that perhaps as a club we are far more resilient down in Kent than in previous seasons. The end of the month saw probably our most eye-catching win as Tooting came to Gorings Mead on the back of an incredible run of results, only for our boys to put in a great display of tactical football to beat such a good side and crowned the week of possibly the decade at the club as we finally secured permission to build our new ground. The party atmosphere that day will live long in the memory! Tooting came to Gorings Mead on the back of an incredible run of results, only for our boys to put in a great display of tactical football……and crowned the week of possibly the decade at the club as we finally secured permission to build our new ground. The party atmosphere that day will live long in the memory! April was probably our most Jekyll and Hyde month of a very Jekyll and Hyde season! After the Tooting game we lost against a poor Chipstead side with our team just not playing anywhere near the standard we are capable of. A delayed flight out to Guernsey saw a great second half performance, three good goals and a brilliant atmosphere with the boys sharing drinks and banter with the Lardy Boys! Back to normality and a largely boring game v Sittingbourne saw two poor sides play on a poor pitch with Sittingbourne coming out on top with a goal when neither team looked like creating anything. With our last away game came the Horsham supporters’ fancy dress extravaganza and, on another terrible pitch, we almost conspired to lose the points only for a last minute goal from George Branford ensuring a well deserved win in the end! We have had to use forty-three players this season, an absolutely ridiculous amount and the turnover, some through choice, some to money and some just short-term had made it very hard to ever get a settled side. In saying that, since Christmas we have had a good group in general and the boys have gelled and got on well and our form in the second half of the season is top ten. Our target at the start of the season was forty-six points and we have upgraded that a couple of times so we have to be happy in general. We beat a lot of the top sides and most of the bottom sides but have struggled in the mid-table games, which suggests lack of depth in the squad and a lack of game changers in the final third. Losing Kneeser and Doddsy for the season were two huge losses and its important to keep in mind we never really had a centre forward after that. The fact that only Darren Boswell hit double figures this season tells you why we have not done better. Easier said than done but this is an area we have to improve on next season but finances will dictate what we can do. On a personal note, I would like to thank Jeff Barrett for all his work this season. He is a brilliant help and has done so much paperwork for me this season, I think we are keeping the obsolete fax machine in production! Darren Etheridge (and his fantastic dad) provide us with so much support. He is a brilliant asset to our club and a top man in our eyes – without him we would be lost. Andi Marfleet, who leaves us after today’s game, does great work to get the boys back on the pitch (as well as Steph and Simon Smith who have stepped in for him this season) and Andy McCarthy who not only keeps Pells on his toes but has been stand in physio on a number of occasions and goes about his work quietly but so efficiently. The two main men for me, Adam Westwood and Ian Browne – both of which have won us games, supported the boys and dragged us through a tough season and who in their own, often completely different ways make us a good team. They go unsung and their work adds so much to what we have here. Thanks to you both. Kevin Borrett and John Lines and the whole committee – never putting any pressure on us and providing quiet support as well as their magnificent work in securing us the ground. Most importantly I want to thank the players. It’s not been easy at times and we have had more challenges than a normal season but they’ve rarely let us down and I hope they all want to stay and help us to improve next season. Finally I want to thank all the supporters of this club. They make it what it is and during the poor performances and the good days they always encourage and drive the team on. The boys always play better when the crowd is noisy and despite winning the league last year, I think the big wins this season have been better and we have some great memories of a mid-table season – something I never thought would be the case!